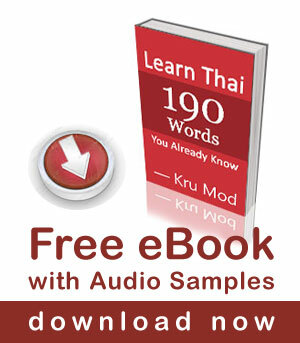 There are 32 vowels in Thai language – 14 long vowels and 18 short vowels. I usually recommend my students to start learning the long vowels before short vowels. See the long vowels here. Hello. Are the vowels in the photo sorted in the correct order? If not, what is the standard sequence of the vowels? I clicked on the link to go to the long vowel section but got a blank page or 404.
swatdee krup, khun sabaidee mai ka? i am learning thai and got help to your side well. Sawatdee ka! I would just like to thank you for these lessons, I was just wondering if you can make a video of short vowels too. Thank you! This site and your youtube-channel, all is very good, well done. you and others spend a lot of time teaching the world many things about Thailand and culture. Also the language. I see you are still taking time to reply to all the comments and so on. Very good and very kind of you! Last year I have been looking through your site and informed you about the links that did not work. I just recently started to try to learn Thai language all over again and was looking for videos about grammar and so on. But it is a little confusing to me. I still would like it very much, and I am sure that many people will appreciate your work, if you could make the time to do some new videos about the pronounciation of all the vowels, short and long. And the consonants as well. On the prints is used a dash – and you use ooh-aang. “I usually recommend my students to start learning the long vowels before short vowels. See the long vowels here. This link is not working anymore. Do you mind sharing the book name that you scanned for the vowel chart above? Could u show me how to read 32 vowels please? Thank you for your suggestion. I have a video on 32 vowels, I will upload it soon. 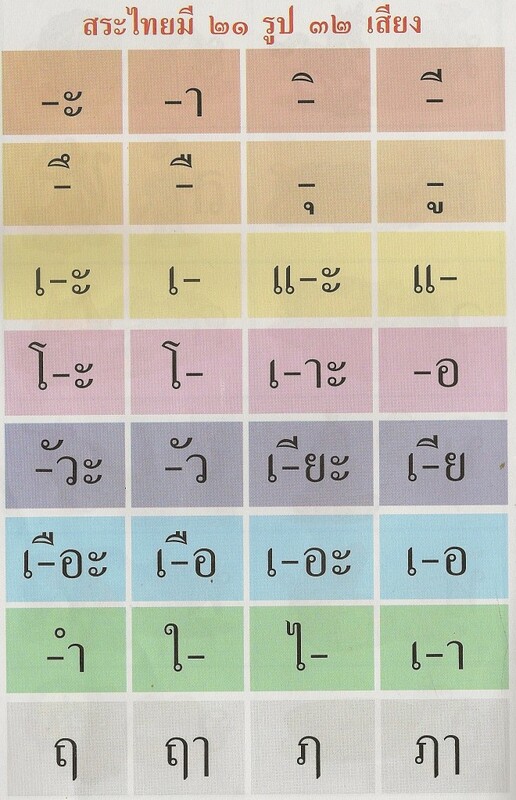 Kindly provide what I think is Lesson 5, 18 Thai short vowels. All previous lessons are fantastic & I am very grateful for them. They helped me immensely in my teaching my 9 year old daughter in teaching her to read & write Thai. I am a 75 year old father & she is look krueng. I like Thai langauge very much. I am Cambodian but I started learning Thai lanagauge when I was 20 ys. I am 50 ys already. I don’t see the ั vowel in the list there? I just noticed this when trying to read มังคุด when watching your fruit video. Is there a reason why this vowel is not included in the 32 ?? The ” ั ” is another form of ” ะ “. When you add a final consonant, ” ะ ” has to change the form to ” ั “. It is the 2nd one on the 2nd row, if there is no final consonant, อือ has to be written with an extra อ.